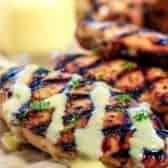 These honey mustard chicken breasts are grilled to perfection with a delicious homemade honey mustard sauce. Mix together Dijon, Honey, Soy Sauce and Lemon juice. Remove 3 tablespoons of the Honey Mustard Sauce and set aside. Preheat the grill to medium and grill the chicken 6-7 minutes per side or until juices run clear and the chicken reaches 170 degrees. Drizzle over chicken breasts and enjoy!